Soundpainting is the live composing sign language created by New York composer Walter Thompson for musicians, dancers, actors, poets, and visual artists working in the medium of structured improvisation. 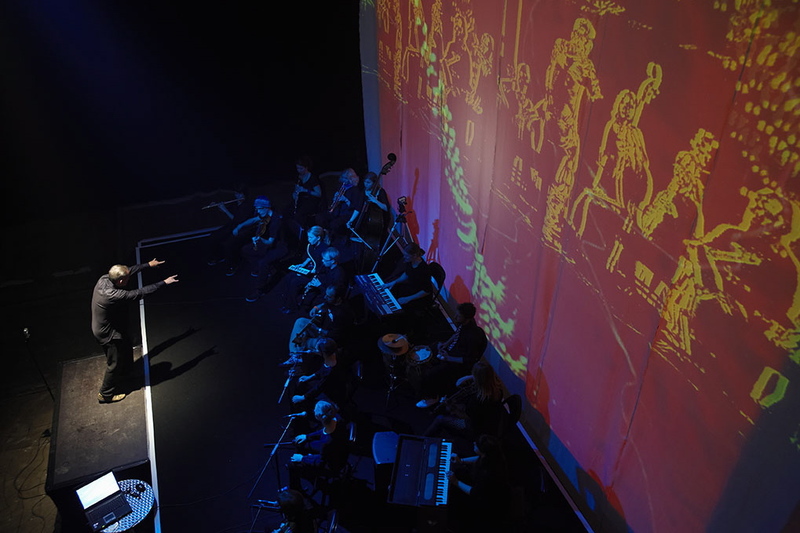 At present the language comprises over 750 gestures that are signed by the Soundpainter indicating the type of improvisation desired of the performers. Direction of the composition is gained through the parameters of each set of signed gestures. Soundpainting differs from both traditional composing and improvisation, it includes both, but also everything in between. It is not like traditional composing in the sense that a soundpainting piece rarely is written in advance and that the performers often have a lot of freedom of choice. It is also not like free improvisation in the sense that the soundpainter in front of the ensemble gives the performers directions. However, a soundpaintingperformance can move on the whole scale between improvisation and composition. There might be one part where the soundpainter gives very strict directions concerning what note a musician should play and how, and an other part where the soundpainter chooses to give the performers almost totally free hands and merely supports the improvisation of the ensemble by for instance assigning roles to some of the performers. It is also possible to include prerehearsed parts and use them as colors in the soundpainting composition, play them as they are or rearrange them live. Compared to free improvisation one of the advantages of soundpainting is f ex that even a very large group of performers and with different backgrounds can improvise together without problems. 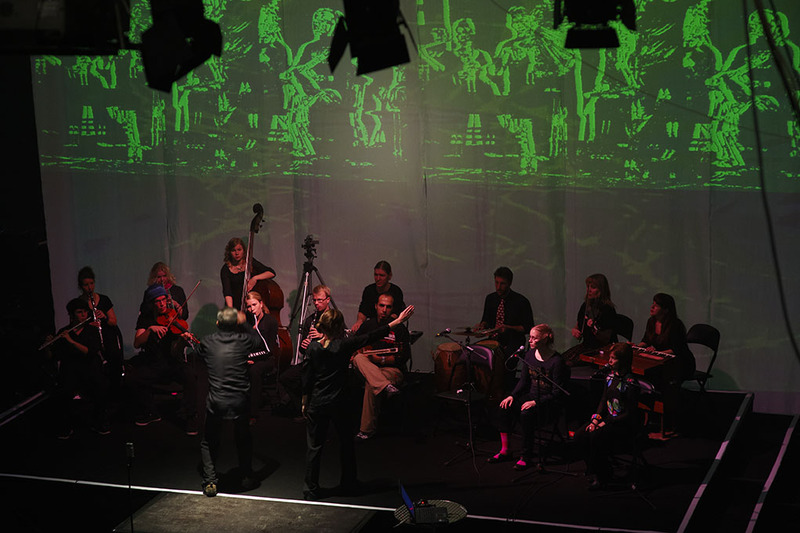 In theory there is no limit to how many performers can participate as long as everyone can see the soundpainter. Soundpainting also makes it possible to make quick changes in the piece and for the ensemble to, all at once, jump back to a theme that was improvised earlier in the piece. Compared to traditional composition one of the advantages of soundpainting is that the composer can be spontaneous and rearrange the piece live or change the direction of the piece altogether in the middle of the performance, all of this without having to disturb the performance by shouting directions to the performers.